The rapidly growing cybersecurity firm is about to make a major change in management. Here's why that's disappointing for some investors. Shares of cybersecurity firm FireEye (NASDAQ:FEYE) have fallen more than 8% since the beginning of May. Most of that loss was fueled by the company's first-quarter earnings report. Although FireEye's business continued to grow, it isn't growing as fast as many analysts had expected. To make matters worse, FireEye investors were hit by the news that its longtime CEO, Dave DeWalt, would be stepping down. On June 15th, control of FireEye will pass to Kevin Mandia, FireEye's president. Mandia is the founder of Mandiant, the cybersecurity tech and consulting company FireEye acquired at the beginning of 2014. He has a long track record of success in the cybersecurity industry, and has been at FireEye for over two years. He may be able to take the company in a new direction, and help reset investor expectations. 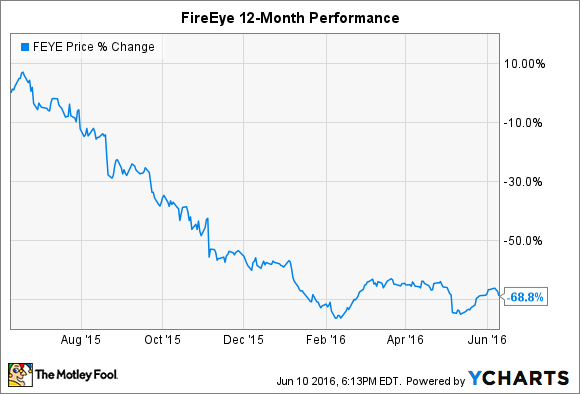 With FireEye shares down almost 70% in the last 12 months, it's badly needed. But there's one aspect of DeWalt's departure that's concerning, and it weakens the FireEye bull case in an important way. Since it entered the public markets in the fall of 2013, FireEye has often been seen as a potential takeover target. It's a pure play cyber security company in an innovative, rapidly growing market. FireEye's solutions for advanced persistent threat detection have attracted the interest of corporate buyers, and its annual sales have risen more than 285% over the last two years. Unfortunately, FireEye has been consistently unprofitable, and has bled cash for most of its history as a publicly traded company. FireEye spends a lot of money on research and development, but its biggest cost has always been related to sales and marketing. Last quarter, it cost the company 61% of its revenue, down from 88% in the first quarter of 2014. A larger company could be better positioned to absorb FireEye's costs, and sell its products in a more efficient manner. Rumors have swirled that FireEye could be acquired. In 2014, DealReporter said both Oracle and IBM were considering a bid (via Benzinga). Sell-side analysts were unable to confirm the report, but admitted that a tie-up could have merit. FireEye's decision to name DeWalt its CEO in 2012 lent credence to the idea that the company would eventually be sold. Prior to joining FireEye, DeWalt led two other companies that were ultimately acquired. In Oct., 2003, EMC announced that it would acquire Documentum for around $1.5 billion. At the time, DeWalt was Documentum's president and CEO. Then, in 2007, DeWalt left EMC to lead cyber security firm McAfee. Three years later, Intel purchased McAfee for nearly $7.7 billion. In a 2013 interview with Business Insider, DeWalt gave his impression of corporate culture. Instead of doing research and development [they do] acquistion and integration...[Corporations] use [their] balance sheet to buy the innovation and then [they] integrate...If you look at the appetites of the Ciscos and Microsofts and SAPs and Oracles, they almost have to buy every quarter to fuel their growth. Given his track record, the idea that DeWalt was brought in to sell FireEye to one of these firms was hardly far-fetched. DeWalt never confirmed that FireEye was for sale, or that he was brought on to sell the company, but many investors may have believed it. His departure weakens that notion. "I want to ask the question I think that's on a lot people's minds," said JPMorgan's Sterling Auty on the company's May earnings call. "I think there's a number of people that are reading into [your departure, Dave,] that perhaps you tried to sell the company, it didn't happen, and then you decided to [step down]." In his response, DeWalt never confirmed or denied the possibility that the company could be sold. Rather, he expressed strong support for FireEye's new CEO. Nine years building Mandiant, not easy to build a company from $0 to $100 million in revenue; not easy to build the reputation and brand Mandiant has...we have really put together a management team of the future, a board of directors of the future. It's still possible that FireEye could be sold, but with DeWalt's departure, an important element of that argument has been stripped away. Going forward, investors interested in FireEye should be less concerned with possibility that it could be acquired.